Gloster Aircraft : The nucleus of the Gloster Aircraft Company was formed in 1915 although it was initially called the Gloucestershire Aircraft Company. The first aircraft components were produced at H.H.Martyn and Co of Cheltenham. By 1917 the Company were producing large numbers of fuselages and spares and this is when the historic Belfast Hangars were constructed. By the end of World War 1 the Company was capable of producing 45 complete aeroplanes per week. H.P.Folland the Chief Designer of the old Nieuport Company joined GAC and helped produce the “Bamel” in 1921. This was a high speed, single seat biplane that could be adapted for use as a military fighter. It won many races and held the World air speed record of 212.15mph in 1922. Also in 1922, GAC received its first foreign order from the Imperial Japanese Navy for 50 Sparrowhawks. The development of the Mars, Gannet, Grouse, Grebe, Gamecock, Gambet, Gorcock, Guan, Goral, Goring and Gnatsnapper aeroplanes followed on. Between 1924 and 1929 a complete series of racing seaplanes were designed and built to compete in the world famous Schneider Trophy. The Gloster III A was second in the Trophy in 1925. In 1926 the name of the Company was changed to the Gloster Aircraft Company as overseas buyers found the “Gloucestershire” rather too difficult to pronounce. The Gloster VI named the “Golden Arrow” was the first Gloster monoplane and broke the World speed record at 336.31mph on September 10th 1929. Around this time the Gloster factory became a centre for many forms of aeronautical development including helicopters and variable-pitch propellers. The AS 31 was designed and built as a twin-engine aerial survey aircraft. This aircraft carried out a 60,000 square mile survey of the Zambezi Basin in Northern Rhodesia. With the worldwide recession in the early 1930s, the Company had to manufacture a wide variety of products including fish-fryers, steel milk churns, steel roll-up shop fronts, motor car bodies and motorised bomb trolleys. 1934 was a very hectic year for the Company as this was the year that the Gauntlet fighter was ordered into production. More important than this though was the amalgamation with Hawker Aircraft Ltd. The successor to the Gauntlet also saw its first flight in 1934 - the world-renowned Gloster Gladiator. Between1936 and 1939, 527 Gladiators were built of which 216 were exported to Belgium, China, Greece, Finland, Iraq, Ireland, Latvia, Lithuania, Norway, Portugal and Sweden. Gladiators distinguished themselves in many places during the second world war, but none more so than in Malta. For over 3 months 3 Gladiators were the Island’s sole air defence against attack. The Islanders affectionately called them “Faith”, “Hope” and “Charity” as they rose to do daily battle with Mussolini’s air force. Despite the fine performance of the Gladiator, Glosters realised that the days of the biplane were numbered. Hence a small single seat monoplane fighter, the Gloster F5/34 was built to the same specification as the Hurricane and Spitfire but unfortunately lost out for mass production to the latter planes. Glosters were building the Hawker Henley light bomber in 1939, as well as 1,000 Hurricanes in the first 12 months of the War. The last of the 2,750 Hurricanes built at Brockworth was delivered to the RAF in March 1942. About this time production started on 3,330 Typhoons for the RAF. In the meantime Glosters were working on a small plane which was to revolutionise the world of flying. This was the Gloster Whittle E28/39 which was the world’s first turbo-jet aircraft to be developed. It was powered by the turbo-jet engine invented by Sir Frank Whittle and had it’s first flight at the GAC airfield on April 8th 1941. 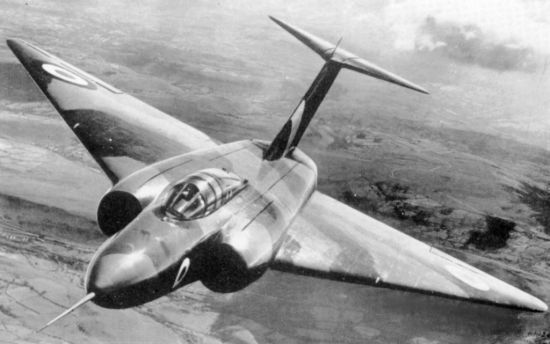 After much research work, the twin-engine Meteor Fighter was developed, this was the only allied jet aircraft used in the War. It was one of the most outstanding planes ever built and in 1945 it established a World Speed Record of 606 mph. The Meteor was built in 36 variants for 12 different air forces throughout the World. It was realised that the British Isles could be threatened by bombers flying at high altitudes and dropping their bombs through cloud cover guided by means of radar. Hence the Javelin was developed as a two seater all-weather fighter, which could fly faster than the speed of sound and reach altitudes above 50,000 feet. With it’s characteristic delta shape the Javelin was awarded super-priority production in July 1952. Due to a lack of further orders from the Government, Gloster Aircraft Company closed in 1962. Gloster Javelin The Gloster Type GA.5 Javelin was designed by Glosters to specification F.4/48 for an all-weather fighter capable of a maximum speed of 600mph at 40,000ft. The solution was a large, twin-engined, delta, the first of its kind in the world. 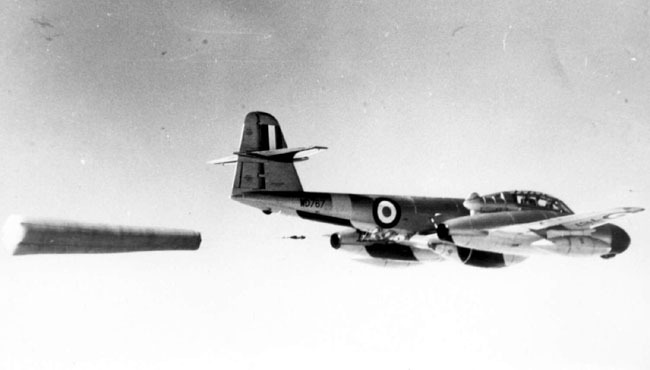 The Javelin was also the first fighter to introduce guided weapon armament into the RAF. The first prototype (WD804) flew from Moreton Valence on 26 November 1951; it was followed by four further prototypes. The type was evaluated by an American delegation and the Javelin was ordered in quantity applying much of the £37m funding from the US under the Mutual Defence Aid Plan. The aircraft replaced the Meteor NF Mks 11/12 and Venom NF Mk 3 in service. Its top speed was some 45 mph better than that of the Meteor and its ceiling 12,500ft higher at 52,500ft. F(AW) Mark 1 The Mark 1 was powered by the Sapphire Sa6 and equipped with the AI17 radar. Armament was four 30mm Aden cannon in the outer wing. A total of 40 was built and it joined 46 Sqn in February 1956. F(AW) Mark 2 The Mark 2 was similar to the F(AW) Mk 1 but equipped with US AI22 (APQ-43) radar in an enlarged radome. It entered service in June 1957 with 46 Sqn. T Mark 3 The trainer variant was built to specification T118D calling for a machine with dual control. The cockpit was redesigned to allow for the rear seat to be raised and an enlarged canopy fitted. External periscopes on the fuselage side assisted the instructor (in the rear seat) to view gun-aiming. F(AW) Mark 4 The Mark 4 was similar to the F(AW) Mk 1 but with an all-moving tailplane fitted. 50 were built and the version served with eight squadrons. F(AW) Mark 5 This variant improved on the range of the F(AW) Mk 4 by introducing a new wing with internal tanks for an additional 250 gallons of fuel. F(AW) Mark 6 The Mark 6 incorporated all the developments of the F(AW) Mk 5 but reverted to the US radar of the F(AW) Mk 2. The type, of which 33 were constructed, was issued to four squadrons including those using the F(AW) Mk 2, which employed both versions concurrently. F(AW) Mark 7 The Mark 7 was the most numerous of all versions of the Javelin. It was fitted with the Sapphire Sa7 delivering an extra 3,000lb static thrust (11,000lbs) over the Sa6. The fuselage was lengthened to accommodate the engines and revised nozzles were incorporated. Armament was extended to include four wing-mounted Firestreak air-to-air missiles. It had been intended to reduce the cannon armament to two, but delays in Firestreak development led to the retention of the original four guns in many aircraft. The F(AW) Mk 7 entered service with 33 Sqn in July 1958 and with full Firestreak armament with 25 Sqn in December of that year. F(AW) Mark 8 The Mark 8 was the final production version of the Javelin. It employed the Sa7R Sapphire with partial reheat which enabled it to outclimb and out-turn the Hunter. It used the US radar coupled to a Sperry autopilot. The version also had a revised wing with a slightly drooped leading edge and double rows of vortex generators. Other improvements included simpler engine starting and better windscreen rain dispersal. F(AW) Mark 9 The Mark 9 was the definitive version of the Javelin although there were no new build aircraft; all (116) were conversions of the F(AW) Mk 7. They differed from the Mark 7 by incorporating the reheated Sapphire and the wing of the F(AW) Mk 8. Numerous minor improvements were included, although they did not alter the external appearance. F(AW) Mark 9R This was the Mark 9 with extended range (R). As the RAF lost staging posts between the UK and the Far East in the 1960s, it became important to fit the Javelin with in-flight refuelling. Large probes were fitted to the starboard fuselage and canted underwing pylons accommodated four 230 gal tanks. 22 aircraft were converted. The Javelin was withdrawn from service when 60 Sqn disbanded at Singapore on 30 April 1968. Gloster Meteor The Gloster Meteor was designed by a team led by George Carter during 1940 to take advantage of the still unproved Whittle turbojet, and Air Ministry Specification F.9/40 was written round the Gloster proposal for a single-seat twin-engined fighter armed with four 20 mm British Hispano cannon. Twelve prototypes ordered February 1941, of which only eight built, with various engines. First to fly, on March 5, 1943, was DG206, powered by 1,500 Ib st (681 kgp) de Havilland H.ls, and with a wing span of 44 ft 3 in (13.49 m). Next to fly, on July 24, 1943, DG202 had 1,526 Ib st (693 kgp) Rover W.2B engines and span of 43 ft 0 in (13.11 m); and a prototype with 2,000 Ib st (908 kgp) Metrovick F.2 axial-flow turbo-jets, DG204, flew on November 13, 1943. One other prototype had H.I engines and pressure cabin; remainder powered by Rolls-Royce built engines of Whittle type. Gloster Meteor F. Mk I: Initial production con-tract for 300 F.9/40-type fighters placed June 1941, to be named Gloster Meteor and powered by 1,700 Ib st (772 kgp) Rolls-Royce W.2B/23 engines named Welland. Twenty built to F Mk 1 standard with four 20 mm cannon; first flight January 12, 1944. Twelve delivered July 1944 to No 616 Squadron to become RAF's first jet fighter unit, becoming operational in August against V-l flying bombs. Max speed, 415 mph (675 km/h) at 10,000ft (3,050 m). Time to 30,000ft (9, 150 m), 15 min. Service ceiling, 40,000ft (12,200 m). Empty weight, 8,140 Ib (3,737 kg). Gross weight, 13,795 Ib (6,258 kg). Span, 43ft 0 in (13.11 m). Length, 41 ft 3 in (12.57 m). Wing area, 374 sqft (34.7m2). 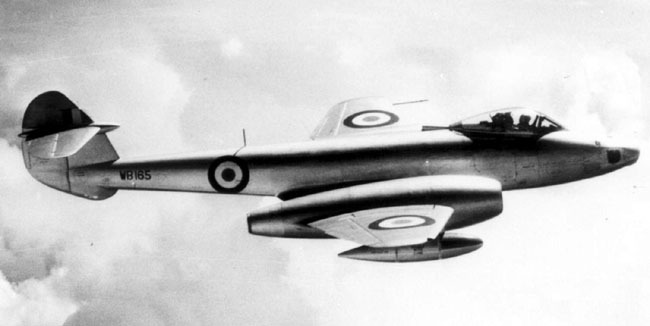 Gloster Meteor F Mk II: Projected with 2,700 Ib st (1,226 kgp) Goblin I engines. Gloster Meteor F Mk III: Similar to Gloster Meteor I, with 2,000 Ib st (908 kgp) Derwent I (W.2B/37) engines, sliding in place of hinged canopy, increased fuel, slotted air breaks and other improvements. Total 210 built, first 15 with Welland engines; first flight September 1944. Deliveries to No 616 Squadron December 1944 and operational with 2nd TAP in Belgium with Nos 616 and 504 Sqn early 1945. Gloster Meteor F Mk IV: Improved Mk III with 3,000 Ib st (1,362 kgp) Derwent Vs in long-chord nacelles, pressurised cockpit and other improvements. First flown May 17, 1945; production deliveries of Mk IV, and development of later variants, post-war.